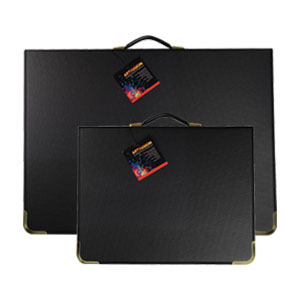 Artfusion Portfolios are attractive portfolios with a smart leather look. This range of portfolios feature a strong mechanism to hold work securely in place, metal corners to protect the external case corners and an internal pocket to keep extra documents handy. The Artfusion Portfolio has a smooth running heavy nylon zip. Available in black in A3 and A2 size.